The tyranny of stuff | I wanna love You better whatever it takes . . .
My car is bugging me these days. More to the point, what my car is costing me is bugging me. The amount of money I am spending on my (leased) car, and on the insurance for said car, is something like 20% of my take-home pay. The insurance is high because the lease requirements stipulate that there have to be certain coverages…and probably because I have a few skeletons (of the speeding ticket variety) in my closet. But I am once again wrestling with my choices, and wondering whether there is some way out. The irony of my life is that I wrestle with having so many things, and yet, I really don’t have much compared to the people I see around me*. Perhaps this is still a remnant of my junior high and high school years, growing up on the low end of middle class but surrounded by classmates on the other end of the spectrum. Even beyond that, though, I often think that there is something not quite right about me. I am bewildered as to how other people save money to buy a computer, or a car, or a new mattress, or a vacation. Money to me is something that comes into my life and just as quickly goes out. My relationship with it is, and always has been, convoluted. 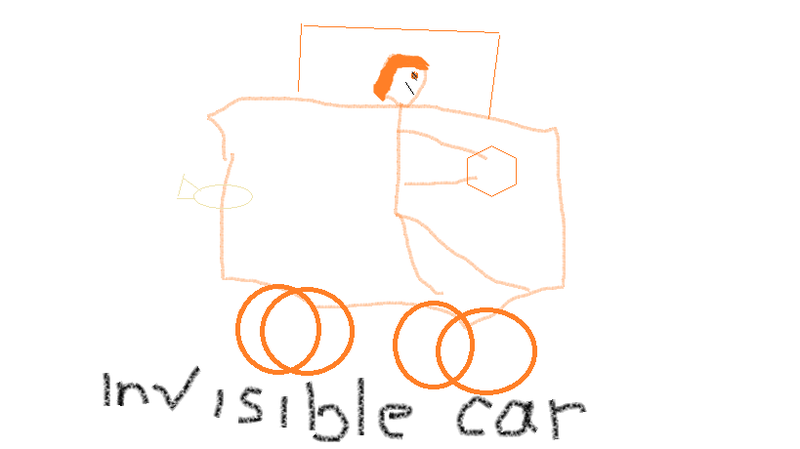 As you can see, even my invisible car was orange. This is the second car I’ve owned in my life, and the first one that I really have felt like I’ve “chosen” (after a slight mishap/false start). And despite my angst over owning it at all, I really do love it and love having a car. (I am still not a fan of mandatory bus travel, although Elijah would be thrilled with it!) But I will be paying this fairly hefty sum for two more years, and then will likely be paying for at least another three years if I end up buying it (which I likely will, either because I will have gone over on the mileage, or because the various dings and scratches will be too much to turn it in). I am not careful with my things (see also: my current computer and cell phone). Right before I got my car, I was seriously considering taking a job that would have been a substantial pay cut for me. I reasoned that I could take the bus (a short ride, no transfers) to that job, and so would not need a car. I still dream of taking that job, not because it’s the job I want, but because it’s not the job I have. Budget-wise, though, it’s simply not possible. I think there is probably some way that I could turn in my car early…I would have to pay some kind of penalty, I’m sure, but I would still be paying less in the long run than I will be by keeping it. The thing is, though, that I know that I do *not* want to do that, not unless I absolutely have to. So I try not to think about the fact that I don’t have the luxury of taking a job that pays much less than I’m making now…and I try not to think about my ongoing angst about “stuff”. But when I look at my budget, what I struggle with is the lack of autonomy those payments represent. I tell myself that I would have money for a new laptop and plane trips to see people I love and who knows what else, if only I had not made this choice to love this thing in my life. I just don’t like what it’s keeping me from. Maybe I just need to find gratitude for what I have…it may be true that this car limit my choices in some ways, but in another sense, it opens up choices that riding the Rapid would not afford to me. For now, then, I guess I just need to live with where I am, as I try to figure out where I’m going. *PS – PLEASE know that I am well aware that even in my “lack”, I am among the wealthiest people in the world. I’m just constrained by the context I’m in.